Some of these areas generate a lot of money, others very little and some are good for promotional benefit only. Each area of music has its own set of rules, contracts, licenses, considerations and royalties and differ depending on whether you are a songwriter, an artist, or both. The following gives you the basics of what you need to know to make money as a songwriter and artist in today’s world of music. Every time a song is downloaded or sold in a physical form (CD, vinyl, etc. ), the songwriter and music publisher are paid a combined 9.1¢ from the record company. For example, if the song has 100,000 individual track downloads from iTunes and is on a 500,000 unit selling album, the total “mechanical” royalties would be $54,600 ($9,100 + $45,500). In addition to these “song” royalties, the artist would also receive recording artist royalties for each sale based upon the royalty provisions of his or her recording contract. If the song becomes a major radio hit, the total songwriter and music publisher “performance” royalties could easily exceed $700,000. These royalties come from the fees that are negotiated by the performing right organizations (ASCAP, BMI and SESAC) with the many users of music (radio and television stations being the largest) and which are split 50/50 between the songwriter and music publishers involved with the song. Writers and publishers have to join one of these organizations to receive these royalties. The royalties in this area can vary greatly depending on which organization you join as well as how many times the song is performed and the type of station it is performed on (a performance on a large station will be worth more money than a small station, etc.). Also, ASCAP, BMI and SESAC give extra bonus monies to songs which generate a great many radio performances in a 3 month period; sometimes tripling the amount of money for a hit song (e.g. $200,000 in royalties becomes $600,000). The song also receives many thousands of streams on the Internet (web radio) resulting in additional song royalties to the writer and music publisher. The recording artist, on the other hand, receives even more money for these very same streams of the record from SoundExchange (the entity that collects for artists, labels and background musicians and vocalists). An artist has to join SoundExchange to receive these record “performance” royalties. There is also no fee to join SoundExchange. The song is next put into a major motion picture resulting in a $40,000 songwriter and music publisher “synchronization” fee. If the film were an independent feature film, a documentary, a student film or a film being shown only in film festivals, the fees could be as low as $500 or “gratis” depending on the budget of the film. In many cases, the writer and publisher will negotiate “step deals” where they receive additional “synch” monies if the film achieves certain box office numbers. In addition, every time the movie is shown on broadcast television or cable, the writer and publisher will earn monies from ASCAP, BMI or SESAC. Once again, this shows the importance of registering with a performance rights organization. If you are not associated with ASCAP, BMI or SESAC, you will not get your song royalties for performances of the movie. If the original master recording is used in the film, the fee will normally be the same as negotiated for the song and is shared 50/50 by the record label and the artist. Based on the song’s success, a video game developer wants to use it in a Guitar Hero / Rock Band type game. As opposed to most video games that pay only a one time “synchronization buyout” songwriter / music publisher fee to put the song into a game, many music intensive games pay a song either on a per unit sold basis (e.g. 1¢ per game sold) or on the game reaching certain sales plateau numbers (e.g. $ 4,000 to put the song into a game with an additional $4,000 for each 250,000 units sold). Additional monies are also earned when a song is downloaded into a game. As many of these types of games sell millions of units, the monies can be substantial for the songwriter and music publisher. If the original master recording is also used, the record label and recording artist will receive the same amount since they usually license on the same basis. With Rock Band, you can make your song available for gamers to buy and play. Each time your song is bought, you are paid a fee that you must split with the publisher (after all, the song was “reproduced” when it was bought and downloaded). many variations in between. For example, CSI will ask for one type of license and American Idol a totally different type of license. Fees range from $9,000 to $30,000 for the use of a known song in an episode of a successful series depending on the type of license and the media requested. The fees for lesser known or new songs are less than the above. If a TV show wants to use your song as a theme, the producers will also many times license the master recording of the song. For example, The Sopranos TV series not only used A3’s song “Woke Up This Morning” (through a license with their publisher) but also licensed the original master record from the group’s record company under a separate negotiation. If the song is specifically written for the TV show, however, the production company will virtually always own the publishing rights and master recordings. The song is placed in a “catalogue musical” similar to the Journey songs used in the show “Rock of Ages” and the Green Day songs in the Broadway show “American Idiot”. The deal that the music publisher agrees to is one that pays all of the songs in the show a percentage of the gross weekly box office receipts. The show becomes a big hit grossing 1 million dollars a week in New York with the writer and publisher earning $200,000 in theatre royalties for the 1st year of performances. These are just some of the ways that music makes money in today’s world. Granted, you have to have the right song or record as well as be knowledgeable enough to take advantage of opportunities when they are presented to you. That said, opportunities to make money from your music are greater than ever before. Recognize them, take advantage of them, and enjoy your career in music. 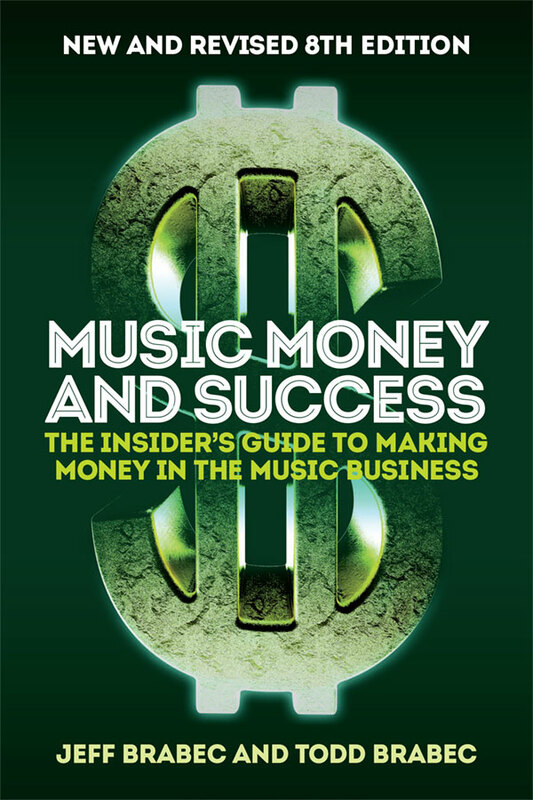 Information contained in this article is from the Jeff and Todd Brabec book "Music, Money, And Success: The Insider's Guide To Making Money In The Music Business" (Schirmer Trade Books/Music Sales/505 pages/6th Edition). See also the Brabecs’ website: www.MusicAndMoney.com.